The Netherlands is the European part of the Kingdom of the Netherlands, which consists of the Netherlands, the Netherlands Antilles, and Aruba. 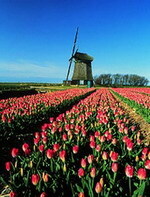 The Netherlands is a constitutional monarchy, located in northwestern Europe. It is bordered by the North Sea to the north and west, Belgium to the south, and Germany to the east. The Netherlands is often called Holland. This is incorrect as the provinces of North and South Holland in the western Netherlands are only two of the country's twelve provinces (for more on this and other naming issues see Netherlands terminology). The Netherlands is a densely populated and geographically low-lying country and is popularly known for its windmills, cheese, clogs (wooden shoes), delftware and gouda pottery, dikes, tulips, bicycles, and social tolerance. If you are not interested in travel , then you have already missed a lot. 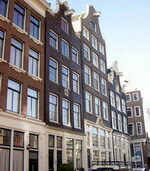 This gay-owned and straight-friendly guesthouse was built in 1777 on the former coastline of Amsterdam and still has her original facade. In a quiet area - one street behind is the longest shopping street in the Netherlands and all tourist attractions are within walking distance. Barangây is a Filipino word meaning small village or community. Ask any Filipino for more information Our tropical decorated guesthouse is located in a typical Amsterdam canal house built in 1777 on the former coastline of Amsterdam. The house has still her original facade with gable stone of an island with 3 palm trees. We welcomed our first guests in August of 1999. We give each guest a warm welcome, a uniquely decorated room and of course our world famous breakfasts! Located in one of the charming houses of Amsterdam, you will find the Hotel Kap conveniently located in a quiet residential street, right in the centre of the city. All major attractions are within walking distance and public transportation to all directions is just around the corner. We are looking forward to meet you - you'll be more than welcome... Due to the 19th century house-style character of the hotel we offer different ranges of rooms. All our 13 rooms are equipped with shower and television and most rooms have their private bathroom. Now introducing a new self-catering apartment within the hotel.